Although Quakers have their ways of letting people know what we are about, those who have ever attempted this challenge will know that doing so in just a few simple words is not at all easy. At times we would seem very much more complicated than we would like and so there is a definite moat to our castle. I can remember once being taken completely by surprise when a professional football player asked me what a Quaker was. My response was to start telling him all the things we are not, which I think Quakers do sometimes. He probably went away with an understanding that we are a peaceful lot, and unlikely to rob banks for a career. Since it seemed I had let him down, a few days later this football player picked up an envelope in his post. Quaker literature instead of the usual fan-mail must have come as a bit of a surprise. I could imagine him wondering where to put it on the team coach although since the next away fixture was at Newcastle United, he had a very good introduction to Friends and plenty of time on the journey up north to read it! It would seem to me a most valuable resources that Quaker Castles can get literature to support them. A few days ago I also received the Quaker equivalent of fan mail. There was this mysterious pile of brown envelopes placed on a chair just outside the Meeting Room with an invitation for any visitors to take one. Most Meeting Houses have a rack of leaflets, although not everyone has the confidence to take all that that they need straight away. A very thoughtful, gesture made me instantly feel valued. Instead of entering a room full of silent people, I felt among Friends. At times it is easy to forget that castles can be very intimidating places to the outsider. If you are not met with some kind of a welcome there might just as well be a portcullis come crashing down before you. In one Meeting I know, elders get there early and everyone outside the room is told to move away from the door or keep their voices down. Some of the mistakes we make would seem to come from an awareness of who we are as Quakers and then the wish to communicate this sense of identity to others. In some cases I feel it would be helpful for our focus to change so that we begin with a thorough appreciation of our guests. Established Quakers experience a sense of belonging through a shared way of life, clearly understood set of priorities, and language all of our own. There may be an assumption that everyone has the confidence and ability to be like us. Some Meetings for example provide an invitation during notices for newcomers to stand up and introduce themselves. For some, especially if the Meeting is quite large, this could feel like an audition. Although the reason for doing so is not obvious, newcomers are encouraged to sign the visitors book. At times we would seem to forget that to attend Meetings outside the local area usually requires petrol. When Quakers enthuse about ethical investing and responsible consumerism, perhaps I am not alone in thinking how lucky these particular Friends are to have the means to do this. Although funding is often available for conferences and courses, those most need of help tend to feel least secure and so there might well be a reluctance to ask. Besides culture, language may also be a problem. Perhaps I am not alone in having wondered for a considerable number of years what a "meetings for Sufferings" might be. It sounded pretty awful, but I didn't like to ask in case some Quaker suggested that I go there! It is possible for even reasonably seasoned Friends to listen to Quaker notices and emerge none the wiser! Political views may also be a deterrent especially when forcefully put. This not the same thing as plain speaking. What we have here is an opinion. A peace testimony promoted with little regard for those of a different view can seem very aggressive, even hurtful. The more we stamp our identity as a cultural rather than a religious group, the more exclusive we become and so fewer people are likely to feel they belong. Quaker Meetings can seem like looking at an arrow slit, somewhat threatening if you are not in exactly the right position and considerably easier on the inside. So how can we encourage people to come and remain as part of our castle? To me this is a matter of going back to basics. Given all the other distractions, we need to remember what a Meeting for Worship is for. Whatever our background, knowledge or experience I believe we are intended to be human beings, gathered together in the silence to listen out for God. Learning to "Be More Dog"
"Maybe we should all be a bit more dog. For someone who has gained confidence writing a blog called "Secret Quaker", grabbing the frisbee seemed like a big undertaking. As a very necessary precaution, it was necessary to consult my personal trainer before moving up to this level. Conveniently she just happens to be a dog. As we set out yesterday morning, my dog can have had very little idea where we were heading. It may have seemed particularly unfair to be wearing that particular harness, a little humiliating as if nobody properly appreciated just how well she could now walk to heal. Suffering may often be unexplained. At the time it was impossible for her to predict the roar of a train rushing past, how a dog might react and and that this unusually tough restriction was not a judgement but imposed only through a wish to protect her. At first the route through the woods seemed familiar. To a dog there were the smells, for humans bluebells and other signs of spring. Then we stopped to join a queue of people, who instead of turning to pat a very well-behaved dog were, quite unreasonably fumbling around for change. Then a bus drew up which looked the same as any other since dogs are colour-blind and unlikely to recognise numbers. At times dogs like people may require a little guidance. On the command "Over" which to humans may be translated as "Mind the Gap" things started moving. A dog can live very adventurously even though when you find yourself on a moving bus surrounded by strange people, it did quite suddenly seem very strange. That process of buying a ticket might seem of very little significance to a dog. Since for one pound dogs get a whole days travel it would suggest our local bus company prefer carrying dogs about the town to people under the age of 60. This enthusiasm for dogs is even more apparent on trains because here they travel free. Sometimes dogs are just like people in having no idea just how much they are loved. Whereas people might look out of the window or talk to other passengers, dogs see mostly legs. Instead of enjoying the view, there are the smells of which there would seem to be quite a few. People may consider the environmental impact and a moral obligation to reduce our global footprint.To a dog Public Transport only becomes particularly significant if there have ever been crumbs on the floor. On the journey back when even a dog feels tired, there was that moment of revelation. Then the most amazing smell happened when a lady with a rabbit in a pet-carrier came and sat close by. Those moments when a dog feels inclined to ministry should however be responsive to the sense of the Meeting, especially when this happens to be on a bus. Since not everyone shares that same enthusiasm for rabbits, through a shared silence my personal trainer was able to hear a command from someone tugging gently at the harness that she was expected to be centreing "Down!" At times it may seem the temptation to bark at rabbits can be very great. With people too there is the risk of making judgements which can be very hurtful. We don't tend to waggle our ears about in Meeting so perhaps in listening dogs really do have the advantage. The commands we hear may not always be of our choosing, or even understood. Even though at times we may Quake at the effect, such promptings are given to us through love. For us also they are to obey. Dogs also are able to count their blessings, such as that small bag of chicken pieces which suddenly and mysteriously appeared on the bus! When suffering is great, we appreciate the good things more. At times, even without a collar, it is possible to experience guidance. My most recent experience of this began when I probably wasn't thinking very straight. Through some crazy impulse I decided to tidy up my computer and in doing so cleared all my viewing history. My computer had been doing nothing to be ashamed of, and so it decided to protest. Initially I was quite dismayed to discover that I could now I could no longer open my Facebook or Secret Quaker Twitter account. Late at night it was possible to imagine all my facebook Friends deciding to up and off as if there was now no possible form of communication available, no likelihood we would ever meet again and the telephone hadn't been invested. With a little additional thought, I realised that this for me this was a lesson about the need to simplify my life. It may be argued that these days we are very much too ambitious in the number of our friends. Instead of being a good friend, there is the risk of becoming shallow, inconsistent and much less supportive than we might be. Through so many opportunities to network, we are distracted. Instead of being able to concentrate on where we are and the direction in which we are heading, there is a tendency to look behind, fish about for approval as if our worth as a human being may be improved by the number of followers. Looking back over the past few weeks, it has been very nice not having to worry all that much about what people think by writing only as a "Secret Quaker. Maybe now I am still a little scared. Yesterday however I could feel that tug on that harness, hear the command "Over!" and found myself leaping up into the unknown for the next part of that journey. It is very reassuring to me this morning that I do not have to be anything more than honest. At times you can see the importance of being humble, allowing yourself to led and whether or not you pay for a ticket, no more than a pattern. Quaker Castle Tour part 2- Testimonies. Quaker castles have a tendency to use flags which we refer to as being our testimonies. These are also symbolic and should be seen as of considerably more importance than just decoration. Our testimonies say something about accountability and ownership in the same way as flags belonging to a castle. They are a demonstration of commitment and allegiance. Just as with flags, Quakers have a tendency to put their testimonies in the most conspicuous place. They are not supposed to be hidden. It would seem castles would be very unreliable allies, even utterly pointless without some indication of allegiance. Without evidence our beliefs would also remain theoretical and of very little use. It has always been important for us to remain a part of society and go where we are needed. Our testimonies may not always be welcome, successful, or even understood. At times people have thought Quakers obsessive, pedantic and quite unreasonable in their demands. Even by just showing that we hold different priorities through the way we live our lives can at times seem threatening. Truth/Integrity. In order to truly hear and follow the leadings of the spirit, we must be willing to hear and act on the truth as it is known to us. Simplicity. Friends have sought the essential, knowing that excessive material possessions divide people from each other and from a spiritual life. Peace/Nonviolence. Believing that there is “that of God in everyone" Friends are called to respect and care for all and to "see what love can do" in response to violence. Equality and Social Justice. Since all are God's children. Through holding these testimonies we have been able to campaign for a fairer more just society, been trustworthy and honest in our dealings, promoted various reforms, set an example, and through our refusal to take oaths and the peace testimony in particular, been just a bit awkward sometimes! Testimonies are not for our exclusive use, although just like with flags, they help shape our sense of identity and let people know we are there. Some of these ancient testimonies may seem very fragile. They can blow in about in the wind and weather with age. As society changes, it may seem necessary for some of the more challenging flags to be taken down, folded up and rested for a while. Colours may fade, designs need to be re-worked and new concerns such as a testimony for responsible stewardship to preserve the environment brought to our attention. It might be argued that the earth is already protected if we retain sufficient loyalty to all our old testimonies, so perhaps surprising when this new somewhat less demanding flag seems to be placed a little higher than the rest. This rearrangement may give the impression that Quakerisim is about adopting a particular type of lifestyle and that it is all just a matter of culture really. Lately it has been suggested to me that Quakerisim has become entirely a way of life rather than a religion as if only our flags are observed. 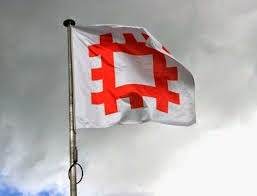 In changing times I think it is important to remember that just as with the Queen, certain aristocrats or even a government organisation such as English Heritage, flags are an sign of allegiance. Our testimonies flag up what we already believe. They are only a part of the castle. We remain strong and connected as an organisation and as a faith group through maintaining our Meetings for Worship. Quaker Castle Tour part 1- the invisible ones first. Some years ago I was told very firmly by my teenage daughter that I needed to travel more. Knowing all too well about my love of history, she talked of places she had visited, then said very fervantly, " Honestly Mum, you should go to Poland, or Germany! English Castles seem like just a pile of stones in comparison. You can go inside and walk round proper rooms because they look after their castles. It really does limit your perspective if you just stay in the places that you know." These words of wisdom are much in my mind because they remind me of Quakers. Whilst I can write with some confidence about Meetings and Quaker events that I have been to in England and in particular my local Meeting, this is only a very limited perspective. It is evident that Quakerism varies considerably. Through the feedback I have already received from about the world it would seem some Quaker Meetings are more conscious of the need for preservation and look after their castles a great deal better than we do. It might seem a little incongruous to imagine castles in countries such as Canada, Australia and America. To be truthful I am rather glad that they apparently have none because, as I have been reliably informed by various tourists over the years, a search for castles is a very good excuse for people to come and see you! We can learn a great deal from this type of interaction. Tourists of any sort are both a mirror and a window, providing so many opportunities for dialogue and from which we all may grow. In the past English Quakers used to talk of those "travelling in the ministry." Perhaps they still do in some parts of the world although it would seem to me all Quakers should be able to travel and to whatever place and at whatever time, it should be in the ministry. There is so much to be wondered at and valued. Not all will speak to our condition so whilst it is good and reassuring to discover common ground, this does not always have to be called a castle. To those readers who have never had the opportunity to visit an English Castle, please forgive me now for not writing beyond the things I know. As my daughter would say, it would do me good to travel although for the present I am glad for this opportunity to write, realise my limitations and know you are out there! Even in this country, finding a castle can be quite hard. This problem was apparent when my daughter discovered that one of the streets close to her new home was called Castle Road. We were both quite curious, even a little excited so I did my research with a few old maps and photographs that evening. The result proved quite predictable for a new town. About a hundred years ago it may have been very helpful for passing travellers to break their journey at the Castle Public House, although this respite for any Seeker after Truth is not quite the same thing as discovering a Castle. This would seem very much like the search for a Quaker meeting. You cannot just rely on the name. Other types of castles may be identified in this country as a decorative paving stone besieged by modern traffic, or as a sign on the walls of some building, however new. 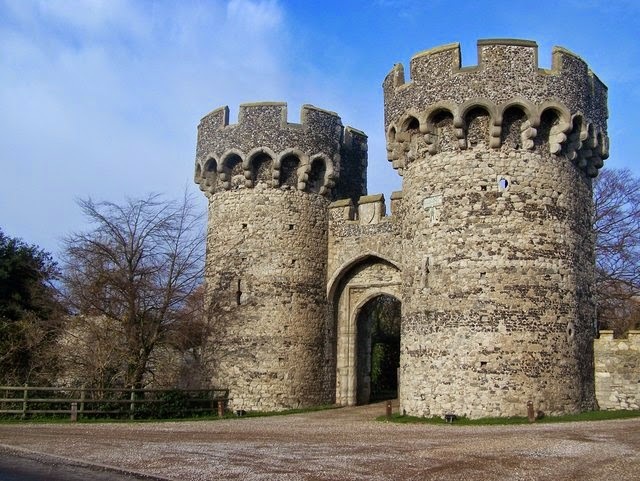 There may be very carefully researched information about the importance of this castle, even the description of some act of notable loyalty, bravery or a hero named. This history is of interest although also somewhat less than it might be. At some point other considerations have got in the way. Just like with Quaker Meetings, you cannot live in the past, still call something a castle if now there is nothing there. At times, even when you cannot see your castle very clearly, or the evidence for its existence seems patchy, you know that it is there. Our local castle is deep underground with no visible trace so you would have to dig deep to find it. It is particularly old, many of its stones were recycled to build the Abbey in the same way as Quakers may find themselves worshiping elsewhere. We may find ourselves governed by practical considerations, even of greater usefulness, in a different place of worship but this does not stop us being stones of a castle if we choose to maintain the association and just happen to have been there. Our castle legacy includes stories of a very large Norman hall discovered intact at the turn of last century, its use as a Country Gaol and of so many prisoners of conscience, many of them Quaker who suffered and were detained there. Around the site there are still several old inns where children could purchase food to support the prisoners at that time. To find our castle you have to dig very deep into Quaker and local history although still possible to consider those prisoners part of our family, our ministry today and consider it an honour to go on providing them with food. Lately there has been a number of reports through the British national media of young predominantly Muslim men going to Syria for humanitarian reasons and then being drawn into the conflict. Yesterday the government asked wives, mothers and sisters of young men who might be considering going out to Syria to do their best to dissuade them. It would seem to me that this is far too big a responsibility for any individual or their family to do on their own. Whilst it will never be possible to fully understand the dilemmas and decisions in other peoples lives, we are all, I believe, part of humanity with a shared responsibility to help in what ways we can. Some years ago, the son of one of my closest friends confided in me his ambition to join the army. Though knowing that I am a Quaker with a peace testimony, I think he was a little surprised that I didn't immediately throw up my hands in horror. Instead I recalled how at one time his father was expecting to be sent to Iraq. He was in the army, had been training all his adult life for such a time as this and believed there was now a genuine threat from weapons of mass destruction. Having been provided with the skills and opportunity to do something, this professional soldier was now prepared to give up his life to protect even conscientious objectors like me. At the time I could not believe that anyone could be so generous towards those who might so easily judge him. It made me feel very small. There is undoubtedly love in war. Each year at the Remembrance Day services, I find it very hard to believe the degree of sacrifice from those prepared to defend ideals,their families, friends, communities and even people they do not know. This would seem to be a major problem about having a peace testimony. Throughout history some totally incredible people who unquestionably deserve our respect, don't believe it. How should we respond? There is the option of considering each war as being a separate case to be judged on its individual merits. Others approach every conflict as a matter of negotiation to determine their degree of participation. Such tactics do not tend to make very effective soldiers. I will own to having considerable sympathy for New Model Army officers when Early Quakers in their ranks considered themselves entitled to choose their campaigns. In all these different responses, I do not believe we are entitled to ignore the situation or judge others as being any less a person through having a different perspective to our own. At times there may be a temptation to argue the case against war on intellectual grounds. It may be observed throughout history that the absolute elimination of your enemy is virtually impossible, such achievements tend to be short-lived and that diplomacy followed by treaties are the usual methods anyway to resolve war. This approach may be quite correct although may not include how it feels to be caught up in conflict. Whilst providing considerable incentive to resolve difficulties early, I could never consider myself entitled to tell anyone that they should learn to appreciate the wider picture and try to think long term. To me, pacifism without understanding or compassion is worth nothing. It may seem at times as if the reasoning has already been done for us. There is now a traditional Quaker peace testimony besides a long track record of some quite incredible individuals who in their different ways have all made a stand against war. 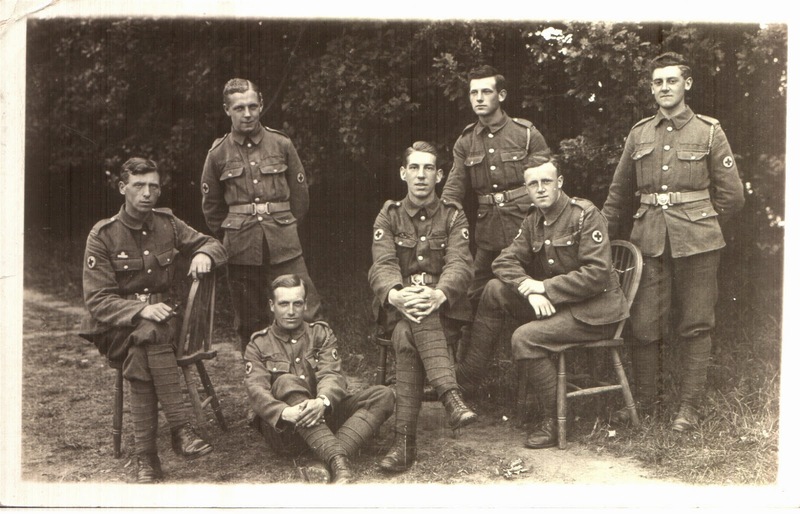 My grandfather for example was a conscientious objector who served as a stretcher bearer during the First World War. Whenever there was a lull in hostilities he would go forward with a companion into no-mans-land to retrieve casualties. They would duck to evade shells, negotiate so much mud, shell-holes and barbed wire, then carry bodies alive or dead, back some distance to the dressing station. Throughout my adult life I have been aware of my grandfather's example. Whilst there will be many opportunities for me as a Quaker to attend peace vigils and protest marches, it is as if he is telling me, "War requires so much more of us than an opinion." Those of us who have had the privilage of working with young people will know they are also Seekers of Truth, generally have very little patience for half-truths, and will be requiring absolute honesty from us. We may attempt to cite Scripture, that crucial commandment for example "Thou shalt not Kill," only to have other apparently conflicting instructions perhaps from the Bible, or through other faiths, thrown back at us. Perhaps they may say that we are too selective anyway of those commandments we choose to follow and so challenge us again. War often requires great bravery, although it would seem to me the struggle for peace is also not an easy option. Since war involves a struggle for power there is a particular objective in mind. Participants might well be motivated by the prospect of being triumphant. For peace there is never an option of winning. You act through a belief in the worth of all humanity, using all your strength at times to forgive whether or not you lose. It may be necessary to start very small, using all your strength and courage to act well beyond the point of reason and forgive. With such weapons I believe, we build the Kingdom of God. Although I cannot believe myself entitled to kill another human being, there is still a great deal that I do not know. Instead of sending our children to war, I think that I would like to say to these young potential volunteers that it is a very brave and selfless undertaking that they are considering and for this I respect them. I admire their honesty and courage. They are a challenge to question and go on questioning whether holding a peace testimony really is the right option. For us all however, right now there is a opportunity. I believe even in war there is still hope for mankind because although our views on this issue may be very different, the things we do for love last forever. The problems associated with being an Early Quaker. "Live adventurously. When choices arise, do you take the way that offers the fullest opportunity for the use of your gifts in the service of God and the community? Let your life speak. When decisions have to be made, are you ready to join with others in seeking clearness, asking for God's guidance and offering counsel to one another?" These words were very much on my mind as I stepped up on to a soap box yesterday afternoon in support of our local Rabbi. This event marking St George's Day was organised through the local Faith Forum to demonstrate the town's diversity and all that was good about us. It was very moving to hear the Rabbi speak of how certain members of his family had been welcomed in England whilst the rest did not survive in Poland. At times it can be so easy to forget how fortunate we are to have freedom. As a Quaker, it seemed of particular significance to be a guest of the parish Church. Just across the road I could see the site of the County Gaol. Whereas I would soon be getting on the bus home, for a Quaker during the seventeenth century, this opportunity to speak would inevitably be followed by arrest. This detention at the King's pleasure for an indefinite time involved being identified as a likely traitor and ostracised by other members of the community. Besides likely persecution, there was the cost of providing for yourself in prison, inevitable exploitation,and extreme financial hardship through not being able to earn a living. The risk and upheaval for their own families must also have been a considerable disincentive for any Quaker taking upon themselves that opportunity to speak. In some ways however there were marked similarities to that time. As people rushed past caught up in their own affairs there was a stern reminder that preaching of any sort, begins as an intrusion and is most usually unwelcome. Our ineffective sound system made me somewhat envious of George Fox whose legendary larynx could stop thousands of people in their tracks even on Firbank Fell. Although these days we might talk of traffic and the music from shops as being an acceptable excuse for voices that do not carry, early Quakers taking advantage of market day crowds had numerous cows, sheep and horses to deal with. When confronted by the challenge of how to attract an audience, I discovered considerable sympathy with those Early Quakers who would deliberately exploit the opportunity of an assembled indoor church congregation by interrupting the service and then arguing with the priest. These very practical considerations to attract attention may also explain some of our more outrageous activities such as Soloman Eccles going about with a pan of hot coals on his head, George Fox letting the people of Lichfield know exactly what he thought of them, and, most notably but undoubtedly effective..... going naked for a sign! It is somewhat disconcerting to be in the company of those who are already busy, mild curiosity at most and the likely attention span of a flea. This problem made me think very fast of how Early Quakers managed. To me it seemed absolutely essential that they began with their audience, found some point of agreement and then kept their message simple. With this in mind, I would prefer not to used the full verbosity of Quaker literature as an entirely accurate record of those times. Instead it is easier for me to imagine George Fox standing up to say, " I've been on a spiritual journey, never found these guys much help, discovered God speaks to us direct. Its been very good news for me!" Yesterday's event may not have seemed in the eyes of the world to have been that much of a success. Not that many turned up because it was raining, an awkward time of day and Christian leaders in particular tend to take a holiday after Easter. They needed speakers to say a few words and so I obliged. I ranted on for a few moments, and for the duration alone, could quite understand how oratory fuels the ego. Afterwards, instead of feeling good about the achievement, it was all very stressful. I could have hugged the bus driver for taking me home! Perhaps this was too cowardly an approach. Unlike with Early Friends, no one heckled or threw rotten vegetables my way. This might be explained because the most positive thing I can say about my effect on this audience is that I am not at all sure anyone heard me! Instead, despite the presence of a random assortment of faith leaders, some curious bystanders and two policemen who had spotted the flag of St George, the ministry I gave came back at me. This spoke to my condition. Through living adventurously I had found myself in the company of Early Friends and come to respect them more. Right now public speaking is the very last thing that I feel like doing! It is good to hold this moment. I can see my limitations all too clearly. Instead of being able to attract an audience, I am at present thriving on the silence and opportunity for writing. St George, the hidden history and why he just happened to be a Quaker. In England there is considerable emphasis on St George being our patron saint. His emblem of a red cross on a white background is on almost anything said to represent the nation. Now we even have a future king with his name. It would however seem appropriate to mention first of all that St George is very much more generous to confine himself to one nation. For the purpose of this blog, it would also seem appropriate to argue that besides all these functions, and a rather misleading impression that St George went around upsetting vegetarians everywhere, he also just happened to be a Quaker. This story begins with several cases of mistaken identity which are crucial to our investigation. There is for example another character quite regularly spotted in Churches whose primary function would seem to involve killing dragons. The clue here lies in the wings. Very big wings with three rows of feathers suggest that this individual isn't very likely to be human. Instead he is St Michael who happens to be an archangel, comes down from heaven with a predictable preference for high places and quite a separate tale to tell. St George however starts with us. This is a matter of direction. As with all human beings, we have no wings, our halos are entirely reliant on merit and may only eventually be given. Although St George's ethnicity is very much up for debate, it is clear that he lived here on earth. At this point we gain our first clear evidence that St George was a Quaker, because he was evidently a Seeker after Truth, sufficiently brave to think independently, and apparently went on a journey. The clothes St George wore signified his level of commitment. Red on white represented blood and the cross an issue of leadership. Here there were to be no short cuts or easy options. Love was to be his guiding force. To see love prevail and so be a part of God's Kingdom, St George was also prepared to suffer. Perhaps you also know the town he visited, where they knowingly fed people to a dragon. Before that princess was tied to a rock, I wonder how many other subjects were considered on the fringes of society, of limited usefulness, a burden to the state, expendable and consequently fed to the dragon. As this town steadily became more select, those remaining subjects believed themselves to be of some importance. There was considerable emphasis on winning and so the horizons drew in and it gradually became smaller. It is of particular significance to his identity as a Quaker that St George saw considerable possibilities in women. In the past Quakers were often criticised for allowing any ministry from women as if they were supposed to be tied to some rock in the kitchen. Instead of seeing some poor helpless damsel in distress, St George saw bravery, self-sacrifice and value in those who have the courage to give of themselves far more than the boundaries of reason. Perhaps even then he was able to predict some ministry about the human condition waiting to be given. For women everywhere it is very reassuring that St George did not merely pay a few compliments about her appearance or stand by to clap but untied her. St George realised that the future of any society is not achieved through the effects of a power struggle. Instead, as any good Quaker should, he lived out a testimony to the Truth, campaigned for a fairer more just society and respected the rights of all. The evidence concerning St George's Quakerism also becomes apparent through his treatment of the dragon. Instead of merely killing the offensive creature, so inviting its family, friends and business associate to join the scene, he dealt with the crisis effectively through maintaining a peace testimony. Instead of reverting to all those panics associated with violence and war, St George realised that to deal with any situation it was necessary to first understand the problem. Through closer examination it emerged that the dragon was hungry. Perhaps in his hunger he had become restricted in his choices, addicted to the wrong sort of food, feeling a little unwell, and did not look particularly good, having developed a nasty rash through an allergic reaction to humans. St George understood the importance of compassion. Every time the dragon opened his mouth, he saw fire- something that looked very much like the power of the Holy Spirit and so knew there was light within! To say that St George had a sword would simplify this story well beyond belief since this weapon is very typical of Quakers. It was a little plain-speaking, very sharp, and could cut through any layers of fear, ignorance, hierarchy or misinformation to re-discover truth. Although kept for much of the time in a scabbard, St George realised that the sword would only be effective if he practised. Consequently he carried a copy of Advices and Queries about, and took considerable care to remain open to any new insight of promptings of the Spirit that happened to be about. Typically of Quakers, St George met the dragon at the door of his cage with a handshake having volunteered that week for this particular rota. Instead of launching in with his ideas, St George knew that the most important requirement of any potential dragon is to feel safe. After first waiting for the dragon to sit down comfortably on a chair, he spoke to the dragon's condition of feeling unloved and being hungry. With a very large casserole pot (using vegetable stock just in case you are wondering!) they made a very large bean casserole, and planned the next part to their spiritual journey together. Since princesses generally like to feel valued, it probably goes without say that St George (despite being human, Quaker and wearing sandals at the time!) came over as a being very attractive guy. In fact he seemed even better than St Michael because relationships tend to work better if you start with the things that you share. Their eyes met over the casserole pot and so it was bring and share from then on! St George, the Princess and the Dragon all lived happily ever after. They attended the local Quaker meeting, sought out truth, distributed recipe books about local caves to increase the number of options, were prompted through love in all their dealings and so continued to invest in the Kingdom. How Quakers got to be described as "Suckers". It was lovely to go away for a few days even though in hindsight, I should have been more aware my mobile phone. This somewhat elderly device is very set in its ways, has a mind all of its own and severe attitude problem when it comes to describing Quakers. Whilst at the beach with a few spare moments, it seemed a good idea to send a text message to my mother, letting her know some things I had been doing and to wish her a happy Easter. There was beautiful scenery about, so many other distractions and at the time it did not seem of particular significance that I did not receive a reply. On my return I was somewhat dismayed when my Mother tactfully referred to that very disrespectful text message that I had sent her on Easter Day. Through lack of vigilance on my part, it would seem she had received a message to say that I was having a lovely time on the South Coast and had spent Easter morning with "Suckers." Even allowing for her alternative Baptist upbringing and daughter's wicked sense of humour, this implication about the Local Quaker Meeting did rather concern her. Since the risk had been evident for a while, I was able to explain how some of the keys on my phone are less responsive than they should be. Instead of providing the word "Quakers" as originally intended, we had both received "Suckers" instead. Although the need for greater vigilance has been emphasised, it would seem to me that even very very bad phones need to be forgiven. I remain sentimentally attached to this libellous piece of technology since it was originally given to me by my son. My Mother remains unconvinced on how a system of predictive text messaging could possibly make life easier! It probably goes without saying that the Meeting for Worship I attended on Easter Morning was lovely. Perhaps all those friendly welcoming individuals would feel a little dismayed to be described as "Suckers." I hope very much that they would be able to see the funny side. The term "Quaker" could also hardly be described as flattering. Early Quakers can have been in very little doubt that the majority of people really did not like them. Although they may not have been described as "Suckers" some of the other terms used at this time went pretty close! These days things are a little different. Quite often, people on hearing that I am a Quaker, will go on to describe some other Quaker they have encountered at some point in their lives. This practice gives me the impression that we are rather endangered (comparable to pandas) so people feel a responsibility to introduce us to each other! Since these other Quakers that I get to hear of, are invariably very worthy, I usually feel a little guilty as if the average expected standard of Quakers has now mysteriously dropped. At other times it is evident to me, that Quakers are not without their faults. They might seem arrogant especially when that characteristic belief of having the Light Within is not properly explained. Traditionally Quakers have been particularly inclined to preaching. This characteristic which often comes full on, is only likely to be welcome if you just happen to agree. At times Quakers can be particularly disruptive, launching themselves in to some form of action simply because they believe there is a right to be heard. When we do not take the trouble to appreciate different perspectives there is the risk of being both arrogant and ill informed. At times Quakers can be so preoccupied by the possibilities of good as to completely ignore the danger. This approach can make us risky to have around. Instead of generating trust, the world suddenly becomes more uncertain- even scary if you do not happen to be particularly strong in the first place. Quakers are not exempt in their ability to make misjudgements, get it all quite wrong, and cause considerable unhappiness to others. Possession of a peace testimony does not apparently stop us from being extremely forceful in our opinions, and arguing with considerable enthusiasm among ourselves. I recall once how a journalist asked me whether Quakers really were a religion. To him it seemed we were now much more like a debating group whose identity was shaped by sharing a particular type of culture, mostly hippies, very liberal and with a shared social obligation at best. This devastating observation emphaised to me how easy it would be to forget our place. To me it would seem the crucial difference between a Quaker and a Sucker was about maintaining our Meetings for the purpose of Worship. Quakers have often been known to describe themselves as "Seekers after Truth." This would seemed to me as being a particularly useful role because it implies having sufficient bravery to take on the commitment of an entirely independent spiritual journey. In the past, when working with young people, I have compared this life experience to pushing a trolley round a very large supermarket. With some of us there may be a temptation to visit only the small specialist shops where everyone there is polite, speaks the same (somewhat mysterious) Quaker language, already knows you, and when you start talking, there is so much you already have in common. It is very reassuring to be surrounded only by ingredients that you feel very comfortable with and know. To me, this is a very introverted process, more a matter of reflecting our culture back on ourselves in a form of self-flattery, than belief. Perhaps there is also some pride in that ecologically produced hessian shopping bag shipped from the other side of the world and containing mostly oats! Instead the very big shopping environment is I believe, about trust invested in the whole of humanity, its worth, potential and freedom. Here there is an opportunity to love the whole of mankind. As we engage with other people we are to be constantly surrounded by choice and challenged. During that journey there will be many different situations. Some products are very conveniently placed whilst others require effort and investment to reach out and find. There might well be a temptation to shop only at eye-level and hurry past the chill cabinets. No body likes to suffer although it may be of significance that ice-cream can only be found in a freezer! Some products will already be on the list so we can reach out with certainty, having already predicted their use. There might well be some luxuries about to serve as a distraction and we don't really need. Perhaps we should be alert to the effects of subversive advertising, choosing our prophets wisely. Despite best intentions, at times it really does seem as if the enticements of a chocolate aisle with all their associated beliefs and the sense of superiority this gives you over all the local doctors and dentists is some kind of heaven! In some areas of the store there will be exotic ingredients to provide a challenge in the same way we might encounter other faiths. All of these items will require us to live adventurously and take more effort. Some may taste really good, encouraging us to come back for more, whilst others seem like a firery blast of hell to our sensitive Quaker palates. There will then be much talk about simplicity, all our Quaker testimonies will mysteriously be revived, and those "heretical" new concepts will remain very firmly on the shelves next time we shop. An honest search for truth encourages us to be very precise about what seems relevant to our condition. Those "three for the price of one" offers can as a result, be a little disconcerting for Quakers. At times we may turn up at the local ecumenical group through love of God and sincere commitment to follow the teachings of Jesus, only to discover that some well-intentioned evangelist has slipped a complimentary copy of the Nicene Creed into our basket! Whilst believing ourselves entitled not to buy every item in the shop, there is however also a very clear responsibility to respect products that are attractive and relevant to others. The bargain basket is strategically placed containing items that do not seem particularly attractive to the manager of that store. Many of these products would seem to have almost reached their sell by date as if there is a very limited capacity these days to gain very much from history. History can get a little bashed around sometimes and without the best of motives, assume improbable shapes. With the right preparation, none of this collective experience need be wasted. Homemade Quaker soup can taste very good. You do not have to digest the whole lot in one go because there is the option of sharing knowledge or putting batches away for future enjoyment in the freezer. Quaker Meetings often have a "celery Friend." These history enthusiasts may be added to any stale old otherwise unintelligible product to revive it! What happens then when you reach the check out? Most of us will at some point look back on their lives thinking "I cannot believe how much that cost me!" wondering if all the items they picked up were worth it and if they have the capacity to pay. Close to the tills there is often a panic reaction as we throw in a few bars of chocolate into the trolley to avoid going hungry. Perhaps we may stop for a few moments, go through that shopping list and then retrace steps for some crucial item that has somehow been forgotten. A few Quakers re-invent the whole week's menu rather than admit they were wrong. As we wander out of that store, perhaps with the addition of halos and wings there will bags of experience to carry, and I believe, that currency of all that we have been able to invest through love still with us. Contains free gift! Scatter wherever you like and Cultivate with care. This morning I had quite a shock to discover the number of people who have been looking at this blog page over the past 24 hours. Although it is tempting to go on at this point about how totally amazing it is for me to communicate in this way, I think it would be more appropriate to just concentrate on using the right currency. Otherwise all that I write here will be like looking at my own reflection (which tends to get less pretty the longer I have to look!) and of very little use to you. With all these potential hazzards in mind, I would rather not be dealing in "amazing" or even being known. Instead, lets forget the lesser options, that wish to feel important, a desire to win or the reassuring feeling you get from believing it is possible to get it absolutely right sometimes. Despite our obvious diversity, it does seem to me this morning that we have an option of moving one step closer together. We might feel a little silly doing this sometimes. Washing the feet of a stranger can be a very uncomfortable business which usually requires getting down on your knees to do. Perhaps like me, you also wonder if it would ever be possible to stand up again afterwards with so many feet to wash, and yet we usually do. Without wishing to put any readers off their breakfast, perhaps I should also mention that feet have an unfortunate tendency to develop certain physical characteristics that could not be described as beautiful (even by your own mother!) and very often smell. There is no guarantee a message of love and respect for another human being will be appreciated, understood or form part of a reciprocal arrangement. Instead there is only an opportunity to do something for this troubled broken world, to put ourselves at a lower level to another human being, to go where we are needed. Whether or not it feels right, comfortable or seems to be successful, I do not think any of us should allow ourselves to be misled. To love is the most powerful thing we do. Even though we may not be able to imagine, believe in God or feel entitled to use his name, the things we do in love for another human being last forever. There are rewards described in the Scriptures as "the Kingdom of God" we can neither imagine or see. Love entitles us to work for nothing else, because the presence of love is enough. Whatever our starting point in life might be, whatever we believe and wherever we might be, just one single act of love can bring us together. Instead of even trying to write something sensible this morning, or trying to impress anyone, I am now going to do something reckless. Please go back to your families, your families, your faith groups, your community, wherever they might be. Tell them that someone very scared, very silly, who does not know quite what she has taken on with this blog, and calls herself a "Secret Quaker," is sending you and them her love. Whatever you think, whatever you believe, wherever you are right now, there can be no exceptions because we are already loved. There is more than enough to go around and we are also human. Why it take guts to use the "G word"? It quite amuses me to note the extreme lengths some Quakers will go to at times to avoid mentioning the "G word". To achieve these intellectual heights, and theological detour, we note various aspects of God, embrace that insurmountable academic challenge of finding exactly the right words, hedge our bets by referring somewhat obliquely to "Some Higher Being", and risk offending a considerable number of other faiths by talking solely and very enthusiastically about "The Light Within." Does this process make us more enlightened than our predecessors or even other faiths? Perhaps it makes us proud and less responsive to the guidance which comes through silence? Early Quakers would I believe, have been totally mystified about how anyone could possibly "quake" about an entity entirely within them selves. It would seem to me as if these days we have chosen to dispense with that sense of urgency and wonder. This fragile relationship reminds me of partnerships which go on for years on a day to day basis without taking on a commitment. There may be many benefits. A relationship of this nature could be mutually understood, result in economic stability, a lovely home, and even children. Some would argue it is considerable more honest to scrutinise and review a relationship with such regularity, rather than to take on a new identity, risk becoming half the person you were before and be straddled with the lasting commitment associated with marriage. Those who have ever been married will know that marriages are not made in heaven, coming without any blemishes and a life-time guarantee. Instead they are not the same thing as romance and there will be many, many challenges ahead. Instead of being made in heaven, we have an opportunity to create a little bit of heaven through them, through honesty, love, compassion, tolerance, forgiveness, the manner in which we choose to support other family members and bring up children. It would seem to me that, just as the term "marriage" implies commitment, using the word "God" extends a matter of belief into an undertaking that will affect the choices we make through life. Given all the other opportunities about and that a Covenant of this nature would involve some kind of law, no wonder we seem so afraid of taking on this commitment. As with marriage, I do not think this relationship would be possible without firstly some clear evidence that the other party in this relationship understood and loved them. This relationship reminds me of how George Fox went through a particularly dark time in his life. As kingship was being restored, he had good reason to feel terrified through his links to the old regime, besides a huge sense of failure that the concept of an English Commonwealth had failed. At this crucial time, I think George Fox referred back to his relationship with God. Just as it is usual for one or both parties to wear a ring as a sign of their lasting commitment to each other, he remembered that we have a Law, drawn up through love and understanding of the human race, to keep up going. George Fox spoke later of an ocean of darkness that was overcome by an ocean of light. From that moment on Quakers had a peace testimony through following a very precise instruction contained within the Ten Commandments. "Thou shalt not kill." Those who have read my blog for a while will know that I am about as old-fashioned as you can get as a Quaker. As if by instinct, there is still a seventeenth century trait of resistance to programmed worship, wishing to argue with "hireling-priests", and refusing to cough up on tithes should anybody ask. This morning however, knowing that I would be working later, I got up uncharacteristically early for a Sunday morning and went to the local "steeple-house" for their 8 am communion. It was lovely to be greeted at the door by some friendly natives of the Anglican Church who did not seem at all concerned when I introduced myself as a Quaker. It seemed I should consider myself a guest and just as it would be quite inappropriate for visitors to re-decorate somebody else's home, I decided to respect differing opinions and do my utmost to fit in. An honest search for truth should stand up to scrutiny. For me, the friendly and respectful engagement I have enjoyed with other faiths over the years has strengthened my sense of commitment and identity as a Quaker. Increasingly, I find myself able to appreciate the beauty of an old English Church. This may seem a strange thing to say, but I think these are intended to be used by seekers after truth regardless of where they had got to. We all have a right to be there. Although some people find religious symbols and images a distraction, to me these are a reminder of how nothing in life is static. People adapt to different environments, generations of local people have given their time and their talents to enhance these surroundings, building up layers of knowledge to the best of their ability. Together we have all mellowed, blended in, becoming beautiful over time through love in the same way as our buildings. 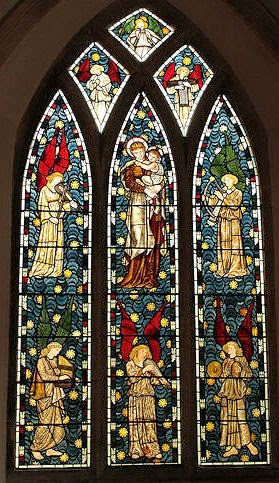 In the silence before the service began, some angels in a church window managed to attract my attention. They seemed quite amenable to some interfaith dialogue, so I introduced myself as one of those awkward Quakers who was doing her best to be the right sort of guest. It seemed only fair to warn them however that just like the Old Testament prophet Jacob, we have a tendency to wrestle rather than just listen to angels. Angels are never quite as they seem. These ones had bright red or green wings which resulted in a very vibrant effect but must have made them feel a little self- conscious in heaven amongst the exclusive radiant white of others. Perhaps they understood how uncomfortable it can feel when you do not feel comfortable with the words everyone else is saying in the creed, that emphasis on belief, not everything said seems relevant to your condition and you do not quite fit in. During this conversation, I couldn't help noticing how, like many Victorian stained glass windows, the faces of these angels all tended to look the same. Perhaps the artists responsible for this work had only one available model. Since it would have been necessary to keep re-arranging her in various poses, she must surely have been someone of considerable stamina and patience. Perhaps a very bored uncomfortable angel with stiff creaky joints was just longing to thump the artist by the time this window was complete! At this point I noticed that each angel was carrying a different musical instrument. Since it might be assumed they were making an acceptable noise in heaven, I began to feel slightly guilty having just purchased a metronome to address some of my musical deficiencies and been terrified of it ever sense. It seemed I have been letting my music teacher down whilst all these angels were saying, "Look what we can do, because we have excellent time-management skills, do not run away from a problem and know how important it is to practice." I promised to try harder so as not to disappoint them. As the service was about to start, I thought again about the angels identical faces, wondering perhaps if our egos slipped away, it might be easier to be one. Early morning Spring sunshine shone through angels to colour the floor with light. It seemed to me that it was possible to be in a considerable number of other worshipping environments besides a Quaker Meeting to hear the ministry of Friends. One step closer. Ways of talking to God. It would seem to me that Quakers have almost as many different ways to describe God as there are Quakers. There are terms such "The Light Within" "Some Higher Being" "a Divine Presence" besides a legacy of adjectives and phrases inherited from our Christian origins. Many of these names and descriptions are quite difficult for me to imagine or understand. As with all words, the somewhat clumsy ways in which we attempt to describe God will mean different things to different people and can be misleading. At times it would seem there is a temptation to be too clever, as if by a huge act of the intellect, or through finding the right set of words it might be possible to do something more. Throughout history there have after all been individuals hoping to gain sufficiently high a status to listen in of the Almighty. Through science, critical analysis and other forms of academic knowledge we may perhaps still aim to construct a tower of Babel, believing that those with a particular type of knowledge should have some kind of an advantage when it comes to communicating with God. Although there would seem very good reason to feel discouraged in our efforts, or dismayed generally at the historic collective insights of the human race, this is only an indication of having set our sights too high. Most religious faiths describe a process whereby for their own protection, God deliberately takes on some very different form to communicate with human beings. To emphasis this disparity, throughout the Old Testament it was widely believed that a human being would die if he ever caught sight of God. Old Testament prophets were as a result, particularly astute in setting what we might well describe these days as being "SMART targets". The emphasis here was not on gaining a special insight or even finding something credible and manageable enough to believe in. Instead of speculating on the nature of God, they considered all that God had done and continued to do through creation, and such evidence though history and their daily lives of love, nurture and support. This trust enabled them to listen. Whereas today we might think to ask questions, even negotiate about what we believe to be the priority of our needs, traditionally communication with God has been almost entirely about worship. The way we might begin this kind of conversation would seem to me very much like my three year old grand-daughter has been practising a great deal of lately. At first the word "thankyou" must have seemed totally superfluous to her requirements. A three year old will however begin with a little prompting and reassurance. It starts perhaps by thanking parents for such obvious things as food. In time those horizons will steadily widen to involve others. Although it is I believe still impossible to see God, whilst thanking others for their time, thoughtfulness, patience, understanding, love, support and forgiveness, each individual life may be gradually seen in context. Perhaps like a small child we should also be alert to Creation. In our search for God we might also blow on the seed head of a dandelion, count the interval between thunder claps and lightening, splash in every available puddle, celebrate every single one of our birthdays with some kind of a party, and remember to paddle whenever we encounter the sea. Maybe we also need to practice guilt-free chocolate and ice-cream through seeing life in perspective. Each moment of joy, humility and thankfulness takes us I believe, one step closer to God. Despite having been responsible for conveying God's law to humanity, the idea of seeing or understanding God would have been quite preposterous to Moses. A healthy respect for the wonder of creation combined with a much more realistic sense of his own unworthiness enabled him instead him to listen out for whatever God had to say. For this reason I am particularly glad to be a Quaker. Our method of worshipping in silence seems more honest about our limitations. This is an open opportunity in which we are all free to follow our unique spiritual journey without believing ourselves bound by ritual, creeds or pre-conceptions. Perhaps in that time we may confirm upon ourselves a responsibility to love our neighbour as ourselves and so emerge from that time of silence one step closer to God through being better at being Friends. Many years ago I became a born-again Christian. Caught up in the enthusiasm and with a strong sense of mission, I decided it would be a very good idea to study Religious Knowledge for A level. For the next few days I went looking for a school that still provided the subject at the required level in its curriculum. This was not that easy task since of all the available "ologies" about, "theology" was by far the least fashionable at the time. Eventually however I discovered a school which cannot have been particularly happy at the financial implications of having just having two very determined pupils and a teacher who for some inexplicable reason was prepared to teach the subject. It was a little strange to be working in a large, virtually empty classroom. The first impression I had of my classmate proved correct. He always sat just behind me as if to oversee every operation in that room as a general. At times he would lift up his desk lid and slam it down hard so I was never entirely relaxed during lessons. This totally unnerving academic genius produced homework good enough for publication. To break the monotony which comes, I believe, from already knowing all the answers, he would sometimes lean back, shut his eyes as if to relax and allow me to answer a question. Looking back on those times I still find it incredible to think of me as a sixteen year old having this opportunity to learn. Spiritual journeys can however develop a tendency to proceed in some quite unexpected directions. With very little regard for my conversion experience which had been very much a matter of belief, some dramatic under-pinning took place almost straight away. The first lesson we were introduced to the synoptic problem. Although this method of comparing gospel narratives proved quite an unnerving problem, from that moment I was hooked. Form criticism came a few weeks later. I struggled at first to understand the concept although an image of the four evangelists each happily constructing a patchwork quilt using all their favourite items of mostly oral history has remained with me every since. Within a few weeks, my missionary enthusiasm had been transformed into those skills necessary to become a detective. Supported initially by that course, I was ready to be objective, identify with honesty centuries of Church politics and tradition to find the historical Jesus. Perhaps it was inevitable that a Seeker after truth should discover Quakers at some point along the way. The company of those who traditionally place so high a regard on the importance of honesty, can be very reassuring on that journey. When you are looking for something however, it does seem very important that you do not loose sight of the focus of your investigation. Like any investigation, there might well be prophets with different priorities, inaccurate, misleading observations, those who distort the evidence and whether intentionally or otherwise, put you off track. In our enthusiasm to dispense with knowledge that does not seem relevant to our condition, there may be a temptation to become arrogant. I am reminded here of my very clever classmate who would deliberately allow me to answer some of the questions. Quakers can seem at times to be a little caught up in their own opinions. It may be misleading to evaluate a course entirely by the exams. My classmate excelled, passed with the top grade and simultaneously gained a scholorship to Oxford. Although my results were not that great, I gained a love for my subject which has remained a passion. Whilst it might have seemed to others that this opportunity to study Religious Knowledge with some exceptional competition, would undermine my faith, or seem disrespectful, I discovered that honesty scrutiny can be very beneficial to religion. It would seem to me that we have been given our minds and each a unique set of evidence for a reason. Our role should be to trust in the power of the truth, take on the challenge of a spiritual journey, engage with our beliefs, because a house built upon rock will last. The Ministry of Children in our Meeting. My local Quaker meeting is notable for the way in which it's children continued meeting whilst all the adults were in prison. Although this story originates from as far back as the seventeenth century, local Friends have given me the impression of being particularly aware of it at times. Lately it would seem there has been considerably less interest in Early Quaker history and since it is now so seldom mentioned, newcomers do not tend to pick up on the story. Perhaps this is a missed opportunity to strengthen a sense of identity and responsibility for us all since it would seem every bit as relevant to note those reasons why almost a whole generation of adult Quakers had been imprisoned in the first place. At some point they must also have been able to communicate the importance of their beliefs in a compelling and appropriate way to their children. Loyalty is not accidental. This needed to be taught. In the past Quaker children were confronted by beatings, buckets of cold water and the taunts of their neighbours. These persecutions only seemed to strengthen their intent. These days there is also opposition, through the attraction of so many other priorities, the media promoting very different ideals, besides the role of parents who might very well find themselves particularly busy and so stay away from Meeting. Despite all these new challenges, I would like to think that although our generation of children may not know or relate to this particular story, its relevance and possibilities are still present in our Meeting. Some of the most memorable ministry I hear still comes from children. There was for example a Meeting during which several adults spoke about the challenge of how to communicate with God. At times it was a little difficult to hear these words because in the background there was the sound of an honest plain-speaking baby telling us about being persistent and that sometimes when you are very hungry, it is necessary to yell to be heard! At times my own children have given me an opportunity to reflect on a deeper level. One morning all three of them were sitting very quietly in Meeting. The oldest was staring intently at the ceiling for almost the whole time she was there. Later she told me very proudly how many little lines there were in the patterned tiles, having counted them all. I would guess adults might have described this deep, thoughtful concentration on some aspect of the environment "Holding the moment". My son was busy trying to learn his spellings knowing that he would be tested on them next day. At first it seemed quite inappropriate to be doing any aspect of homework in Meeting, but then I thought that ministry was about honesty and opening your mind to learn. The problem of a class spelling test was being addressed through silence, surrounded by the support of Friends. To my dismay I saw that my youngest daughter had brought her most treasured possession into Meeting. Within a few moments that little draw-string bag was open and about fifty little plastic dogs were carefully arranged all along the bench. This part of the Meeting House now looked more like a playgroup than a respectable place of worship. Friends who spotted little dogs could see those things which were very precious to a three year old. Though seeing my daughter treasuring her possessions, I was reminded of the joy in worship. Although my own children has now grown up, it is very good to see a new younger generation still enriching the life of our Meeting. If these children were no longer there I would miss the honesty and open-mindedness. There might be no one brave enough to notice a tree that needs climbing. Everyone would be content with just one biscuit which looked the same as all the rest. This would never be decorated with sticky brightly coloured sweets and drippy icing. There would be no excuse to sneak away and to read story books. We might never make our mark on dough, or draw for the first time in a decade because there happens to be crayons about. There would be fewer people about to put you on the spot by asking awkward questions. When someone failed dismally to eat a boiled sweet quietly during Meeting, discovered the hard way that they had forgotten to turn their mobile phone off, or even fell asleep, there would be no one else trying so very hard to catch your eye, suggesting that it might be OK to laugh. To me it would seem children are like any other human being. Our Meeting is so much more alive when they are with us. They have kept us alive in the past and continue to be our future. How to survive Quaker Meeting? It took me many years before I finally got used to our local Quaker Meeting. Although at heart I knew this was the right place for me to be, sticking at it was always going to be, a struggle. For a start there was that very well intentioned "picket line" of Quakers waiting to greet other Quakers to get past. This challenge was made considerable harder as I was particularly lacking in self confidence at the time. There might be several weeks, even months between my visits (the recovery time varies!). Each time I went someone would ask if I was coming for the first time so I never got the impression of making much progress. It may have seemed like a friendly gesture when a Quaker would ask, "So how did you come to hear about Quakers? ", but I used to shrink well back down into my shoes, as if my spiritual journey until this point needed to be explained, there was a standard to be met, and I had suddenly been caught out for doing something wrong! Even now there would seem to be rather a lot of intellectually minded individuals among Quakers. In those early days, ministry often seemed to involve some book everyone else had read. Those complex ministries could be really scary so I tried to see the funny side, imagining all these weighty friends eating a dictionary for breakfast. There were many times I would wonder "What on earth am I doing in this room surrounded by people who do not seem very like me?" To compensate I probably tried a little too hard, hoping that the right impression might encourage all these people who seemed quite a bit older than myself to see a better side of me. It was possible to feel a little envious of new-comers who would introduce themselves with confidence before notices to say how happy they were to be there and that they had found their spiritual home. Perhaps there really were other Quakers sitting in that room at the time wondering what everyone else was thinking. This curiosity about everybody elses' well-being made me wonder about my spiritual performance and if I was doing it right. I can recall some meetings when it seemed a particularly good idea to use the experience of having been brought up in the Anglican Church as an opportunity for prayer. After I had brought before God my sins, everyone I think of, the government, Queen, the sick, suffering and even dead (saints or otherwise), to my absolute horror, only about a quarter of an hour had passed! With no back-up strategy, I wondered whether it would seem at all disrespectful to repeat my prayers or if God would prefer me to discretely look around the room and listen out for snoring. At times I would use the silence to plan the rest of my life, usually beginning with the next item on my agenda which was Sunday dinner. This was not a complete solution, and Meeting for Worship can make you very hungry. The moment everyone had shaken hands, I would evade conversation over a single polite biscuit, to head off home with plans for such a slap-up meal very precisely fixed in my mind, much to my husband's approval! It's strange how any kind of noise can seem so much louder in Meeting. In the world outside Quakers, no one notices if you cough, but here the building seems designed for any possible sound to bounce loudly and repeatedly of any available wall. For some unscientific reason, tummies always seem to rumble louder, so you have to be alert, ready pull in your stomach muscles, then turn to look at the person next you, pretending it wasn't you! To compound these problems, Quakers can be particularly plain speaking when it comes to expressing an opinion. The advantage of this characteristic is that you always know where you stand, and the disadvantage is that you would rather be standing somewhere else if you happen to disagree. The most dangerous hazzard however comes with ministry. As if this wasn't enough to deliver in the first place, (and I can well understand Jonah!) Quakers have a tendency to come up to you afterwards, apologise for not having heard you properly and ask for you to repeat the whole lot again. If you begin a ministry by speaking as loud as you are able, it sounds a bit like yelling. Then everyone in the room looks startled as if they have all just received an electric shock, turns around with an expression of deep concentration and LOOKS! My situation improved quite considerable when a member of our Meeting took it upon herself to get to know me. This was not an easy task. I will always be very grateful for her pro-active non-judgemental but also very tenacious approach to terrified attenders! Through her interest in me and the gift of her time, I gradually came to feel valued. For me this was a very important beginning. I steadily came to believe that there was nothing wrong with being me, that it was Ok to be a little different and have a sense of humour. Instead of talking about what was assumed common ground, we talked talk about a range of subjects, exploring many possibilities. Eventually, a shared interest in Kent County Cricket Club enabled me to stay at meeting! Are Quakers suppossed to break all the rules? Traditionally Quakers have not been very good when it comes to abiding by the law. Instead of taking an instruction as delivered, we have a tendency to stop very firmly in our tracks, consider it on an individual basis at every possible level and then proceed only if it accords with the promptings of our own individual consciences. Consequently we have a notorious record for being awkward and getting ourselves noticed in the most inconvenient way. When everyone else was shutting their shops and businesses on the Sabbath, some of our number felt specifically moved to open them! We could refuse to pay taxes to support the state church, and go to prison rather than take an oath of loyalty to the state. During our disruptive travels about the country with no obvious occupation, Quakers could impersonate vagrants very well! A notable tendency to generate riots, interrupt Church services and insult the local vicar could make us extremely unpopular at times. Whole communities would gang up against us. Those who were not Quakers would have seen it as being entirely justified that so many of us ended up in jaol. Rather than adopt prevailing policy of either the Church or State, early Quakers derived their laws directly from their interpretations of the Scriptures. As a Christian denomination, (at a time when there was no obvious alternative in Britain) they referred to the Old Testament for a moral framework and followed the teachings of Jesus. Typically, since Jesus had taught his followers to be truthful without the additional support of taking oaths, a considerable number of Quakers were imprisoned rather than conform to the State. Although this defiance placed them firmly outside the King's protection, they referred instead to the over-riding, all-encompassing protection of God. Gradually the law has bended to the requirements of a Quaker conscience. We do not need to swear oaths these days before entering university, the professions or to be considered credible in court. We may still at times feel prompted to break the law, although this is usually done as as part of a very carefully thought out process after much consultation for a cause that is generally understood. When you encounter someone who knows a Quaker these days, they do not generally recall their lawlessness, some riot they started in the high street or how difficult it is to maintain a conversation with someone going naked for a sign! Instead it would seem we have a good reputation generally, although I have heard it said on a few occasions that we can be a little bit arrogant sometimes. Through living in a multi-cultural community, we remain open to a wide range of insights. Given this freedom, it would seem particularly important that we are honest about our understanding of the truth. Most religious faiths involve some kind of law because religion is I believe intended to make us better at being human. What we believe is not merely an intellectual exercise but designed to shape our characters. If our old ways and laws are to be replaced, we should still respect the past because this is after all our foundation. Then it would seem necessary to consider with great care why such laws are now being seen as no longer relevant to our condition. My Quaker meeting provides an opportunity before notices are read for any new-comers to stand up and introduce themselves. From what these visitors say, it would seem they include a remarkably high number of "refugees" from other faiths and denominations, looking for the traditional flexibility and open-mindedness of Quakers who do not seem to mind those who find themselves at some difference to the rules. To me this is a very good thing. We should welcome everyone regardless of where their starting point might be. There is however a considerable difference between a sanctuary and a supply depot. I would like to think that coming to a Quaker meeting enables us all to move forward on our spiritual journey rather than merely hiding in the shadows. Perhaps it is this sense of progression which prompts many of these new attenders not to stay with us very long. For some, Quaker Meetings can be quite an unnerving experience. Rules in both the State and for religion, do after all provide a framework, draw those within a community together and create a sense of safety. About God. Making the relationship last. Quakers can talk very meaningfully about those times when they have encountered God. Although these instances can seem very diverse, they are usually happy ones, much like the beginning of a relationship, when you are caught up in all the hope, excitement, and attraction of someone you have met. As with any relationship, this encounter with the divine might well come under scrutiny. After that first rush of enthusiasm there may be critics, sceptics and those who struggle desperately to see the attraction. Among caring friends and family almost everyone is longing to ask the somewhat old-fashioned questions , "Has this new love in your life the means to support you?" and "Where does this relationship lead? Just as a relationship has its challenges, I think there can be wilderness times in religion. What does it mean when we no longer feel elated, external circumstances intervene and joy transforms to suffering? Does God disappear when we are no longer in quite such a good position to praise him? There must surely be more to religion than an emotional response. Lately I have been thinking quite a bit about the story of Moses and the Israelites. On their release from Egypt perhaps there really had been that sense of joy, freedom from oppression and so many possible choices. To keep the Israelites safe, there was however to be a route through the wilderness. Having established a relationship, God provided a pillar of smoke by day and by night a pillar of fire to guide them. About a week ago I arranged to meet a friend in our favourite coffee shop. We chose to sit at a table where there was a view of the floor below, because, one of the pleasures of having coffee out is "people-watching" those busy about their own lives passing by. When I had finished my cup of coffee, I leant against the glass window next to my seat. It struck me then how much I trusted the strength of that glass not to give way. Coming up against something was a very good way of knowing that it was there. Despite the passage of time and very different cultures it would seem there are certain characteristics associated with being human. At times we all have difficulty defining priorities, making best use of resources, acting responsibly and caring sufficiently for others. The freedom and choices we have today can also seem bewildering and scary. There are other available routes and that pillar of smoke or fire may not always seem so apparent these days within a Quaker Meeting. Perhaps it is more instinctive for Quakers to go on testing the strength of glass and even try to leap through it, once they have discovered its there. It seemed to me that morning that I should start thinking like the Israelites. Any relationship needs to work both ways. Just as the glass window had prevented me from falling to the shop floor below, I too should start looking out for a framework of law to guide me. At this time of year Quaker meetings often experience a feature of worship which I have heard variously described as "daffodil ministry." Although this process can occur during a Meeting for Worship, it can happen anywhere. It involves a Friend feeling called upon to describe something very beautiful they have seen pertaining to nature. Since this year has been a particularly good one for Spring flowers, there has been a great deal to say about the impact of all the bright colours and evidence of new life. For some weeks now there have been Easter cards in the shops, easily recognisable even from a distance since yellow is the predominant colour. Right at the centre of our local somewhat large department store, among all the material possessions we might buy, there is as a result of all this yellow, a sudden splash of light. Each year I am re-introduced to those tiny flurry chicks that I used to love so much as a child and for those moments of recognition feel considerable younger. There is also much evidence of Easter Bunnies. This is also very exciting to "children of all ages", (particularly for those who have given up certain luxuries during lent), not so much because chocolate is unusual these days, but at the delightful prospect of eating such quantities of it at Easter! The wonder of creation is something I can understand, so thoroughly approve of daffodil ministry at all times of year. These days people sometimes talk as if there is supposed to be some kind of conflict between science and religion. Such observations would have seemed very strange to early scientists who were so caught up in the wonder of creation. Instead of thinking for one moment their discoveries might undermine religion, they were so confident, believing all they were finding out only added to their appreciation of God's glory. Some Alchemists looking exclusively for gold may not have been so happy, although when a test-tube quite unexpectedly went "Bang!" they almost certainly noticed. Collectively, it would seem to me those early scientists must have been some of the happiest and most excited individuals ever. It seems a little sad how a little knowledge can so easily take away some of the joy. Instead of being regularly surprised, we tend to be more self-disciplined, so often operate in a competitive environment driven by financial considerations and try to predict the results. These days it would seem the emphasis has changed from discovery to achieving a clearly identifiable end product. There is a sense of pride you can get with a little knowledge although I still like to think that scientists can still be motivated by a sense of wonder and then experience joy. In the middle of summer one year I had an experience of God by looking very closely at a blade of grass. Those tiny flowers covered with minuscule grains of pollen filled me with a sense of wonder. Then looking round the field I was in, I noted there were rather a lot of other blades of grass about that seemed to be just like it, besides so many other flowers that I knew so little of. It is possible to feel very small indeed when placed in a field of grass. One of the nice things about daffodil ministry is that it does not stop at the wonder of creation. Moses did not just look at the burning bush and think, "This is incredible, a very lovely sight, now I shall go back and tell my Quaker Meeting about how wonderful it made me feel." Instead he stopped and listened, to discover that a sense of wonder was to be only the beginning. Through listening he discovered his identity, his priorities, a trust that allowed him to overcome his weakness, a sense of mission and opportunity to give something back to God. On first impression today might not seem the best for writing a sensible blog about Quakers. Looking back on previous April Fools days, the one which sticks most in my mind is the year my husband brought me up a mug of tea first thing in the morning which I drank without question. A few moments later I came downstairs with my empty mug to discover the family cracking up with laughter because my tea had been made with a well known brand of instant gravy powder and I hadn't noticed! Most people can recall having been deliberately misled on this day. From looking up some of the jokes that have been played in the past, my favourite so far happenned on April 1, 1698 when several people were tricked into visiting the Tower of London to see the lions being washed. They must have had a very high regard for the bravery of zoo-keepers in those days! Although it is tempting to write a whole entry about April Fools day pranks, it would seem of more relevance to say something about what this festival means to me. We live in a very competitive society where there is enormous pressure to succeed. Although it may be argued that a competitive environment is good for most people, such casualties along the way have tremendous opportunities for guilt. Instead of looking for a reflection of ourselves in the mirror, there is very often a kind of sadness at not encountering the person we are supposed to be. We are supposed to celebrate creation, yet when the images of perfection are too strong, there is a temptation to wipe so much of what we already have away. I like this regular reminder that we do not have to be clever all the time. It is perfectly OK to relax, have fun, even suffer gentle humiliation at the hands of others because egos have a tendency to undermine who we really are and the character we might be. By now it would be almost truthful to say that I am learning to love my mistakes. That notorious inability to remember faces has often landed me into trouble. I can recall so many times when I have deliberately prolonged a conversation, desperately seeking clues as to the identity of this person who apparently seems to know all about me. Two of my children are now qualified first-aiders, a very necessary precaution they would say, because their mother is a crazy impetuous person with a tendency to walk faster than she can see, so often falling over. Given time, it becomes possible to laugh at these situations, although there can be that searing pain and longing to put the clock back. Mistakes have a tendency to keep coming back at you like waves. At first it seems as if you could drown through a sense of failure, but they gradually fade away. Those lessons which are hardest to accept are usually best for us. After what just happened to his staff before the burning bush, it does seem incredible that Moses should retain any attachment to it. I'm terrified of snakes so have huge respect for any Old Testament prophet who would grab hold of one by their tail for whatever reason! Moses however must have had a particular need for his staff. For a start this was a sign of the limited authority he had left since it represented his occupation. Looking after his father-in-law's sheep was a considerable number of steps down from being a royal Prince but at least Moses had the ability to work for a living. Perhaps he needed his stick for support because despite all the representations you see of prophets and saints it is possible to be misled. Not everyone is able to stand up straight all the time. Life may involve a great deal of walking and not everyone is strong. In a challenging situation there is something very reassuring about making regular rhythmic contact with the ground. Perhaps Moses thought as he re-introduced himself to Pharoah's court, considered his criminal record and that very uncomfortable message about letting God's people go, at least he had a stick. Given the highly probable emergency situation, this might be used on a few unfortunate guards as it had been on some of the Egyptian wildlife to protect sheep. To throw his staff down on the ground leaving himself defenceless, without status or support would have been the craziest thing to do. Perhaps it is the Quaker bit in me that says when I do not like something, it is necessary for me to try harder. In fairness to that poor, exceptionally hungry snake who must have had a terrible stomach ache after these events, he does have a particularity long and very well-established reputation for representing wisdom!